Sometimes it’s the stunning photography, the innovative styling, sometimes the who, the why, the where. And sometimes, it’s just about discovering the most unusual Ratatouille-palette-firework-inducing flavour combinations that make the culinary world so enticing. Which just so happened to be the case this morning, thanks to Master Chef Australia’s current contestant Ashleigh Bareham (and if you haven’t heard of Master Chef Australia, then that’s another conversation we need to have), who decided to oven roast Apricots with Rosemary. Who’d have thought. Genius. Yes, that herb you rub meats with, roast vegetables in, and infuse gravies with. That one. On our Galettes. 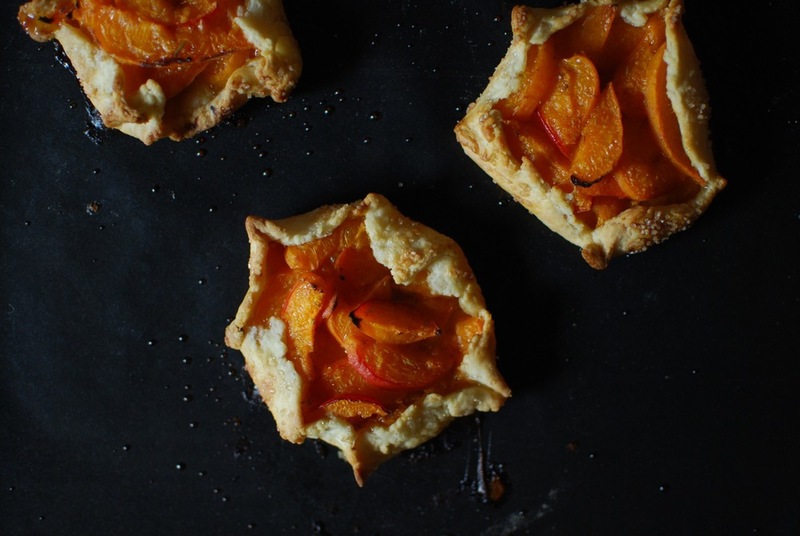 Mini/individual Apricot Rosemary and Honey Galettes, to be precise. While there are those who plan their weekends according to the weather, who will be in town, or their significant others, some don’t plan at all. I like to plan mine according to what I’ll be eating, and when. Please don’t judge me. Today, on this rather unassuming Saturday morning, with a basket of fresh apricots, half a round of chilled Flaky pastry, and a fresh flavour combo to try thanks to an incredibly talented home-cook –come-chef half way across the world, I knew these galettes would be happening first thing Saturday morning. The point I’m trying to make is merely that inspiration can come from anywhere; books, tv shows, your garden, your neighbour’s cat, the great outdoors. And when it comes to you, don’t postpone it. Go with it. See it through. That is the best soul-food. (I also just wanted to point out that having 'dessert' for breakfast is by no means unhealthy, when what you're basically eating is a ricotta-and-apricot-jam-topped, honey-drizzled toast, in Galette form. All balance. No guilt. Just saying). nibs etc. original recipe. makes 3. Preheat your oven to 200*C fan/210*C/410F. Halve and pit your apricots, then thinly slice each half, length-wise. Once all sliced, place into a bowl with honey, and lemon zest. Using a pestle and mortar, grind down your rosemary, which you then add to your apricots. Toss ensuring ingredients are evenly distributed, and apricot slices are well coated. Set aside. Take your 1/4 portion (1/2 of 1 of your 2 chilled Flaky pastry rounds made using my recipe here – note if frozen, allow to defrost at room temperature for 1-2 hours depending), and divide into 3. On a floured surface, roll out each portion into as circular a shape as possible, about 3mm thick. Place on a baking sheet lined baking tray. Place the apricot mixture into the centre of each pastry round, leaving about a 1.5-2cm border, dividing equally between the 3. Then carefully fold the edges up and over the apricots, pinching at the corners to hold in place, until all edges are up, apricots entirely enclosed, and holding in place. Repeat for all galettes. Then brush the outsides of the pastry with milk, and sprinkle with the granulated brown sugar. Place in the centre of the oven and bake for 15-20 minutes, until light golden brown. Remove and serve warm, or cooled, with a dollop of something creamy and white. As featured here, with Blanc Battu (Fromage Blanc), Crème Fraîche, or Greek Yoghurt, for a perfectly balanced breakfast. With ice cream of your choice.Made with another stone fruit of the season such as either nectarines or peaches.